Just look at this little cutie that landed on the desk at Fluff and Fripperies HQ this morning. Isn’t it adorable? This pumpkin scarf is a seasonal addition to Lush’s Knot-Wrap range, introduced last year as a quirky, eco-friendly alternative to gift wrapping. It’s a genius idea, inspired by the Japanese art of Furoshiki -- a traditional method that uses cloth to wrap and carry toiletries, gifts and food. By introducing Knot Wraps, Lush estimate that they’ve saved up to 11.6 tonnes of waste a year. 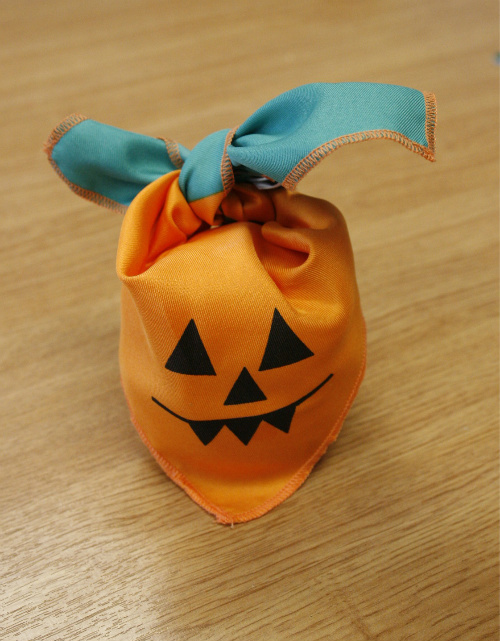 The Pumpkin Knot-Wrap costs €3.00, fits a single bath bomb and makes for a really sweet Halloween gift or decoration. Mine came wrapped around the seasonal Fizzbanger ballistic (€3.80), a candy apple and cinnamon scented bath bomb that adds a little Halloween excitement to bath-time with popping candy and clashing colours of yellow and blue. The Pumpkin Knot-Wrap is available now from Lush shops nationwide, or online at www.lush.co.uk. Have to get this as a treat for my god daughter, she loves Lush! love your blog, im following it through bloglovin!! Keep it up!! Thanks guys! Yeah this would make a great gift alright, bet my nieces would love it too! Can you believe that until recently, I had never been to a Lush store? - now one has just opened in my nearest town and I am seriously addicted! This is so cute, I love it. Have you seen the little Christmas pudding? it is ADORABLE! my four year old is a lush addict - will she bath with just baby bath? no. if she don't get her magic lush robot or bath bomb she is huffing. can't wash the baby for less then £3!!!! Sara, she's a girl after my own heart...!